Having Openings Covered with Tinted Celluloid of the reach of the average schoolboy, but if he has any ingenuity and a little time, a lantern for throwing those colored lights can be made at home, and the necessary parts will not cost much. The metal necessary can be the ordinary stovepipe material, but if it is desired to have a fine-appearing lantern, procure what is called Russian iron. This metal has a gloss, and if used, it should be gone over from time to time with a rag soaked in oil, then wiped dry, to keep it from rusting. The pattern for the body of the lantern, or lamp house, is shown with dimensions. If metal, long enough for the whole length, cannot be procured, then make it in two pieces, being sure to allow 1/2-in. end also on the second part, as shown on the first, for a riveted joint. The metal is bent on the dotted lines and cut out on the full ones. The distance between the lines A to be bent is equal to the radius B. The part A forms the sloping side of the top, and the 2-in. part at the top of the side extends vertically on the upper or vertical part, it being 1/2in. narrower to provide an outlet for the heat. An opening is cut in the rear end, the Base of the Lantern is Provided with a Sliding Part Carrying the Light for Adjustment as shown, also a hole, 5 in. in diameter, in the front end. The size of the round hole is optional, as it should be cut to suit the condensing lens provided. If a lens 5 1/2 in. 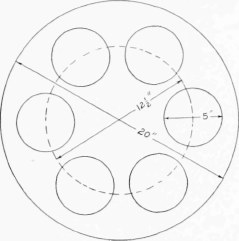 in diameter is used, then a 5-in. hole should be cut. This is enough difference in size to hold the lens from dropping through, while clips riveted on the inside of the lamp-house end will hold it in place. The lens is set in the hole with the curved side outward from the inside of the lamp house. The top, or covering, is cut out of the same material as used in making the lamp house, the length being 12 in., and the sides are cut to extend 1/2 in. on each side of the ventilator. The edges, being turned down on the dotted lines, provide a covering to prevent any great amount of light from passing out through the 1/2 -in. ventilating opening mentioned in connection with the side construction of the lantern. The 1-in. parts of the cover ends are turned down and riveted to the ends of the lamp house. The little extensions on the ends provide a means of riveting the side, to make a solid joint. The arm C is made of a piece of 1/8or 3 1/6 -in. metal, shaped as shown, to fit on the corner of the lamp house, where it is riveted. This provides a support and a place for an axis for the large revolving wheel holding the colored-celluloid disks. The metal forming the lamp house is fastened on a baseboard, cut to snugly fit on the inside. The base has two cleats, nailed lengthwise to form a runway, 4 in. wide, into which another board is fitted to carry the burner. While the illustration shows an acetylene burner, any kind of light may be used so long as it is of a high candle-power. If manufactured gas is at hand, a gas burner with a mantle can be fitted, or a large tungsten electric light will give good results. The wheel, carrying the colored disks, is made of the same kind of metal as used for the lamp house. The edges should be trimmed smooth, or, better still, turned over and hammered down to prevent injury to the hands while turning it. A washer should be used between this wheel and the arm C on a bolt used for the shaft, to make the wheel turn freely. The colored disks of celluloid are fastened to the outside of the wheel over the openings. A yoke to support the lantern and provide a way for throwing the light in any direction, is made as shown. A line along which the lantern balances is determined by placing it on something round, as a broom stick, and the upper ends of the yoke are fastened on this line with loosely fitted bolts for pivots. The lantern is set in front of the stage at the back of the room and the light is directed on the players, the colors being changed by turning the wheel. Sometimes good effects can be obtained by using the lantern in the wings, or for a fire dance, b y placing it under the stage, throwing the light upward through grating or a heavy plate glass.